Fig. 1. Production of soybean transgenic plants with chromatin architecture-controlling genes. (A) Vector used for soybean transformation. Schematic representation of the vector (a) pB2GW7.0-ATPG8 containing ATPG8 and Bar genes, and (b) pCSEN-ATPG10 containing ATPG10 and Bar genes used for soybean transformation. LB/RB, left/right T-DNA border sequences; p35S/T35S, CaMV (cauliflower mosaic virus) 35S promoter/terminator; pSEN, stress-inducible promoter; Bar, coding region of the DL-phosphinothricin resistance gene. The SacI, SpeI, AatII, ApaI, HindIII, BglII, and BstEII restriction enzyme sites are also marked. 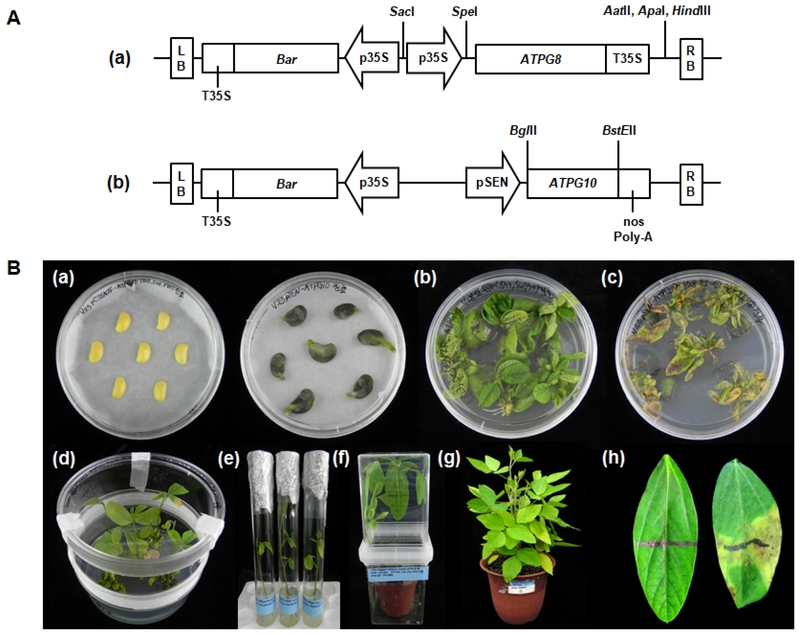 (B) Production of soybean transgenic plants using Agrobacterium-mediated transformation. (a) Half-seed explants after inoculation (left) and at 5 days after inoculation (right). (b) Shoot induction without PPT for 14 days. (c) Shoot induction including 10 mg/L PPT for Bar selection. (d) Shoot elongation including 5 mg/L PPT. (e) Root formation. (f) Acclimation of putative transgenic plant in a small pot. (g) Transgenic plant (T0) grown in a large pot in a greenhouse. (h) Leaf painting using herbicide (100 mg/L PPT) showing sensitivity in non-transgenic plant (left) and resistance in transgenic plant (right).